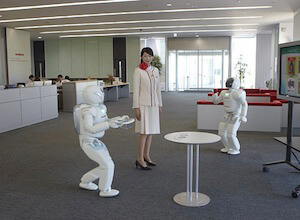 One Asimo interrupts his presentation to announce the arrival of refreshments. Wanna get a glimpse of what the future will look like? Take a look at the all-new Asimo humanoid robot. Honda’s star robot has polished its act by not only improving past capabilities, but with a new intelligence capability the robot can coordinate those capabilities and adapt to changing situations. In short, Asimo has graduated from an “automatic machine” controlled by an operator to an “autonomous machine” that makes its own decisions and gets things done on its own. Asimo was already one of the world’s most advanced humanoid robots. With its astronaut-like appearance, Asimo successfully navigated a constantly-changing “paperscape” terrain without any operator intervention. It can walk up and down stairs, push a cart to wherever you need it, even conduct a symphony orchestra. It can also recognize people’s faces and follow their postures and gestures. Asimo also showed us how good of a listener it is, capable of distinguishing a person’s voice and an odd sound such as a book falling on the floor. Until now, all of those actions were preprogrammed or controlled by an operator, and functioned independently. If you’re kind enough to notice, Asimo has shed a few kilograms. At 54 kg, the new frame is 6 kg lighter than the previous one. It makes for a more dextrous robot. So does the increased strength and expanded range of its leg movements. Put these together with a new control technology, and you have a robot that can walk or run forwards and backwards and hop tirelessly on one or both legs. If it needs to, it can also make mid-motion adjustments and change feet landing positions. Its new legs now enable it to hold a stable posture while walking over an uneven surface. And what is sure to improve its game at RoboCup, Asimo’s maximum running speed has also increased to 9 km per hour. With a new technology developed by Honda for advanced intelligence, Asimo can now simultaneously use visual, auditory, and tactile sensory input to assess its environment. When it encounters a human it uses both face and voice recognition to identify who they are. When multiple people are present and vying for the all-new Asimo’s attention, its voice recognition can parse their voices and identify each one. If a person is walking, it will predict where the person will be within the next few seconds and, if it needs to, quickly change its path to avoid a collision. Cocktail effect and clumsiness conquered. Asimo can hang out with me at a party anytime. Speaking of which, it can grab me a beer too. And if it’s a twist-off, it can open the can for me and pour the frothy beverage into a glass for me – or even a paper cup (Honda could not be contacted for confirmation that a bottle cap-opening model is in the works). Tactile sensors on Asimo’s fingers and a force center in its palm give the hand delicate feedback that is used to control the fingers independently. These sensors are combined with object recognition to pour the contents of the bottle into the cup and not the other way around. Here’s an awesome video of all-new Asimo showing off its all-new skills. Watch it and see if you don’t feel as though it’s all a hoax, that there’s really a little person inside the astronaut outfit. Here’s a video showing Asimo’s ability to avoid collisions with Homo sapiens. In the next video Asimo demonstrates his ability to identify three people talking to him at the same time. To see all of the new Asimo videos go here. Honda has gone through a kind of evolution itself. No longer lumped in with all those machines that can’t think, its technologies and applications developed through R & D for humanoid robots are now part of Honda Robotics. Apparently, like the robot, the company feels it’s time for their robotics division to step out on its own. I simply can’t wait to see what’s next for Asimo. After watching the video, I think you’ll agree that Honda’s taken an amazing step towards their goal of a practical humanoid robots that helps to enrich people’s daily lives.